Our product range includes a wide range of bone cutting saw blade and surgical saw blade. Our organization is engaged in manufacturing and supplying a vast gamut of Bone Cutting Saw Blade for markets, across the world. These blades are hugely popular among our clients all over the country. The offered variety is fabricated using advanced techniques under strict measures taken at the time of manufacturing process. Our products can be obtained by us in variety of sizes, designs, dimensions and other such unique specifications. 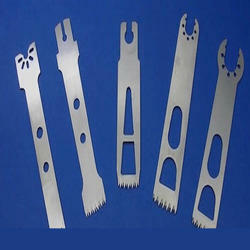 Manufacturer Exporter of Medical Saw Blade Bone Cutting Saw Blade. Our product range also comprises of External Fixation System, Hoffman Fixation and Medical Handpiece.